How many times have you sat down with a Metroid style puzzle and thought "I could really use a hand with this." Or, "wouldn't it be cool if there were co-op exploration here?" What about tackling a Castlevania monster, wondering "What if I attacked its legs, and my buddy climbed the beast to puncture its brain?" Shadow Complex, a "Metroidvania" style game, gave us hope that we'd see some co-op like this. I suppose you're wondering what a "Metroidvania" game is first. Metroidvania is exactly what it sounds like, a hybrid between Metroid and Castlevania style puzzles and gameplay. 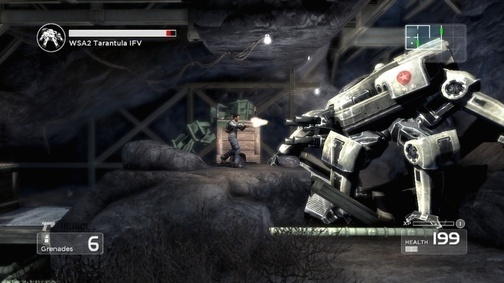 Shadow Complex is a 2D, platformer with 3D graphics, that borrows gaming aspects from all across the board. From switching views to an over-the-shoulder 3rd person view while manning a turret, to similar running-jumping-dodging-shooting action of Contra. Shadow Complex looks phenomenal, and has a lot of the things we like to play! With this new hybrid genre, Shadow Complex gave us high hopes for multiplayer. At least, we thought so initially. Stephen Totilo of Kotaku spoke with lead developer Donald Mustard about the sadly absent co-op. "Mustard loves the idea of trying co-op as a main mechanic in a Metroidvania kind of game. But he said it was an idea that just didn't make sense to prioritize for Shadow Complex. He imagines that, if he could do it, he'd want players to be able to solve complex puzzles in concert, even if they were located on opposite ends of the game's map. In fact, he said that that would be cool if a Metroidvania-style puzzle required players to be spread that far apart." "If we're fortunate to do more games like this..."